JoJo's Lite Brite Emporium: Pajitnov's Pride - you know what we call that? Motherfuckin' alliteration! Pajitnov's Pride - you know what we call that? Motherfuckin' alliteration! 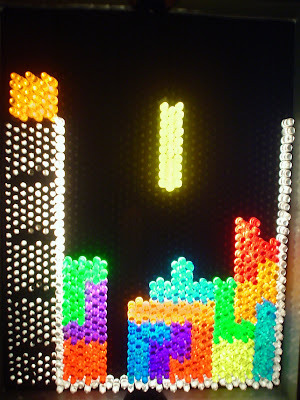 I can hardly think of a better game to transfer into Lite Brite than TETRIS! Getting the shapes of the blocks was slightly difficult due to the irregularity of the hole arrangement, but it came out pretty damn sweet, if I do say so myself!